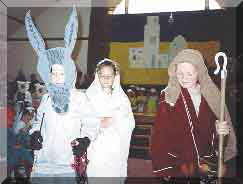 Bruce Goodman's "The Faithful Donkey"
This nativity play is about 30 minutes long. A Donkey, Cow, Sheep and Rooster flee from the Bethlehem stable to Egypt with Jesus and his parents. One by one they leave the company, until only the donkey remains.